THIS DVD CONTAINS the entire lexicographical corpus of Sebastián de Covarrubias. 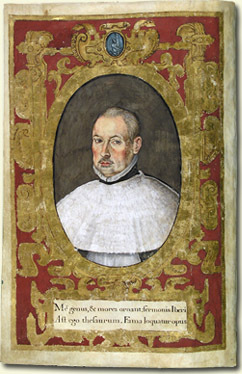 The editors, Ignacio Arellano and Rafael Zafra, have integrated into the Tesoro de la lengua castellana o española (1611) the manuscript pages of the Suplemento that the author left scrupulously prepared and ready for press upon his death. The editors have reconfigured the structure of the entries as well, within reason and respecting the original ideas of Covarrubias, a task complicated both because of the orthographic variations of Covarrubias himself, as well as the unfortunate interventions of the printer. The additions made by Benito Remigio Noydens in his 1674 edition have likewise been maintained, though placed separately in an appendix. The text has been illustrated with an abundant array of engravings and emblems from the period that richly document the work. In this DVD – offered here independent of the book published by the Iberoamericana/Vervuert - the reader will also find, in addition to the complete edition by Ignacio Arellano and Rafael Zafra, the photographic facsimiles of the Tesoro and of the Suplemento, with each of their pages linked to the transcription of the entries that it contains. As is the case for all of the editions of Studiolum, this DVD features a refined search menu that allows for precise consultations throughout the entire corpus: by language, groups of words, refrains or proverbial phrases, etc. A special characteristic of our digital editions is that each individual user can create a personal annotation of the text – that is to say, in essence a personalized edition – by means of the simple creation of a personal work file called a “shadow file”. Studiolum has collaborated in the revision of the Latin and Hebrew texts in this edition by Arellano and Zafra. But we are already preparing a SECOND EDITION, which will include, transcribed literally and indipendently, the text of the 1611 edition and the Suplemento, in order to allow searches by using the original spelling, and which will allow the user to see immediately the original order of the entries. For these texts we provide a copious system of philological annotation with the complete citation of the classical sources. And the Hebrew scholar George Sajo clarifies for us the utilization - often very obscure - that Covarrubias makes of more than 800 Hebrew etymologies. This second edition of the DVD will include other important Spanish lexicographical texts prior to Covarrubias. And, finally, we believe that it is very important to point out that this edition will feature active links to the Diccionario de Autoridades, the CD of which is almost finished, and whose publication date we hope to announce in the very near future. ” El DVD permite una rica variedad de búsquedas, saltos hipertextuales y otros modos de dominar el texto. En los tiempos que corren, pocas veces se ha aprovechado mejor el esfuerzo de unos estudiosos y los buenos dineros que la empresa habrá costado. • Bernardo de Aldrete, etymological glossaries of Arabic origin based on fray Pedro de Alcalá, in his Del origen y principio de la lengua castellana, Rome, 1606, lib. III. And on about 200 «vocablos antiguos…» in lib. II, cap. VI.